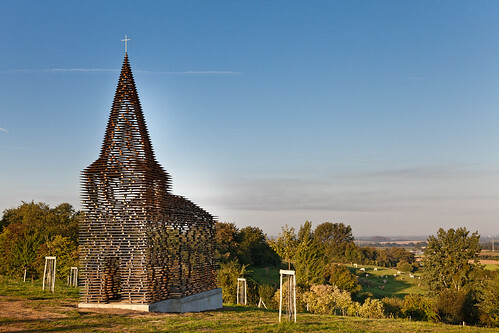 A highly interesting and visually impacting art work in the shape of a church, with traditional spire, has been installed in an open area of rural Borgloon, Limburg, Belgium. The walls, roof and the spire of so called church are made of layers of steel flats with gap between each layer, somewhat akin to a fully opened Venetian blind. This unusual design plays a visual trick upon the viewer - depending on the angle of view and the elevation/location of the viewer, the church either merges fully or partially with the landscape or becomes totally visible to the beholder. 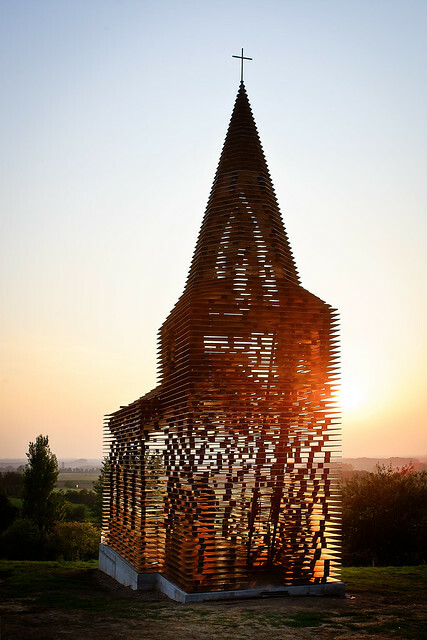 Although officially called "Reading between the Lines", it is quite often referred as "The See Through Church" and also "The Invisible Church". 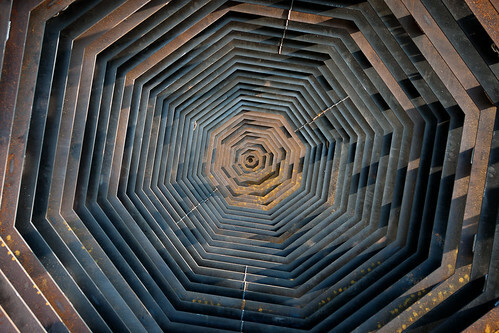 "Thanks to this special construction, the landscape is always visible through the church, at a distance and close up. This means the church is always present, but also absent in the landscape." "Reading between the Lines can be read as a reflection on architectural themes such as scale, the ground plan etc., but the project also emphatically transcends the strictly architectural. After all, the church does not have a well-defined function and focuses on visual experience in itself (one could even consider it to be a line drawing in space). At the same time, the construction demonstrates that this experience is in effect a consequence of the design, since it explicitly refers to the various stages in its conception: the design drawing, the model… Apart from that, because the church does not fulfil its classical function, it can be read as a heritage related reflection on the present vacancy of churches in the area (and their potential artistic reuse)." The 10 metres tall artwork which was commissioned on September 24th, 2011 was designed by Gijs Van Vaerenbergh, a partnership of two young artists Pieterjan Gijs and Arnout van Vaerenbergh. It is part of the exhibition project Z-OUT, an initiative of Z33, the Contemporary Art Museum of the city of Hasselt, Belgium. The Invisible Church is modelled after the village church seen in the background. The village church as seen through the "See Through Church"
Credits: Noisette, a Google Earth addict, volunteer moderator of the Google Earth Community and top contributor in the Google Earth help forum, was kind enough to visit the place to obtain its pictures for this blog. Her images, especially the images of the invisible church with the local church have raised this post to a higher level. Thank you Noisette for taking all the trouble of visiting the place and taking such beautiful pictures. I am also thankful to Z33 art centre, Hasselt for placing their entire collection under "Creative Commons". Being arm chair traveller I depend mainly on CC images and their collection came in very handy for making this post.